Protect your floors and walla from heat, coals, and ashes. R-Co Stove Boards can be installed against walls with no spacer needed, reducing necessary stove clearance by 66% (12" minimum clearance is always required). These boards have a 3 R value. 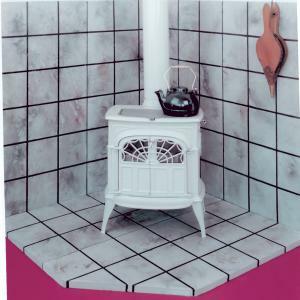 Stove Boards come in brick or gray tile. The brick style has a textured surface, while gray tile surface is smooth. Both styles have recessed mortar joints to give a three-dimensional effect. Stove boards are approximately 1 1/4" thick. They can be cut with an abrasive blade. 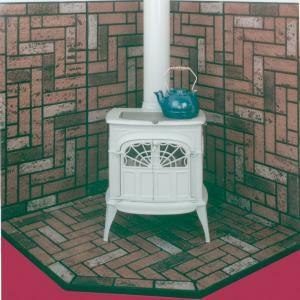 There are four different panel sizes and a matching brick hearth extender. Panels easily attach together with a T-Channel, which is included.